Back in 2010 a little known freeware title by the name of Octodad was developed by a group of students. 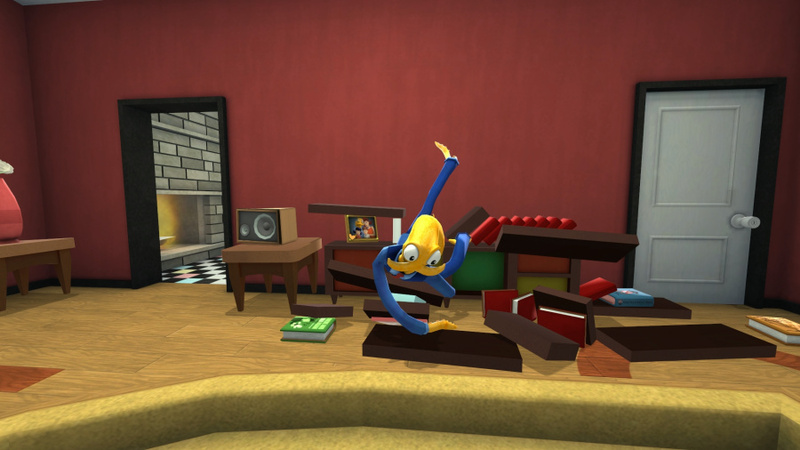 Built using the ever-evolving game development software Unity, Octodad was a fine example o­­f what small development teams could conjure up just by using their home computers. Since then a sequel was born, with its appearance on the PlayStation 4 arguably being the first time it caught the public eye. Now, Wii U owners finally have the opportunity to jump on-board Young Horses' revered title. So was it worth the wait or is there something fishy with the Wii U port? Octodad: Dadliest Catch is a game about an octopus who manages to live the life of an average family man whilst keeping his status as a form of cephalopoda species a secret to all, including his own wife and kids. It's as crazy as it sounds and the game has been designed to make simple everyday things the most strenuous of tasks. The game starts with Octodad in a church, dressed in a suit and preparing himself before he marries his future wife-to-be. At this point it's clear to see that this is an octopus in a suit, but as he makes his way towards the altar, you begin to realise that his partner and friends are oblivious to this striking detail. And so begins Octodad's constant battle to try and fit in and conform, so that he doesn't get noticed and sent back to the aquarium where he came from. As if by pure coincidence his wife, Scarlet, is adamant that the whole family visits their local aquarium for an enjoyable day out. Octodad does what he can to prolong the visit, but eventually caves in to her request. There are a number of different environments that make up Dadliest Catch, and a common objective through the game is to go unnoticed by the general public by acting out ordinary tasks in the most ordinary of ways. You'll soon come to discover that tasks such as mowing the lawn, purchasing pizza from the supermarket and opening a door are likely to catch the attention of passers by due to Octodad's flapping tentacles and constant blubbering. There's also the slight problem of an over eccentric chef named Fujimoto, who for whatever reason has it in for the protagonist. As part of his relentless pursuit to kill our hero, he also wishes to reveal his true identity to his family – as if his murderous campaign to break up his family wasn't enough. Controlling Octodad's arms, legs and limbs is done by pressing the shoulder buttons, whilst the analogue is used to control which direction he moves. A big part of controlling him involves picking up and grabbing items. This is, quite deliberately, the most difficult element of the control system and the most frustrating for it. For example holding down the right shoulder trigger gives the player control of Octodad's right arm and the analogue sticks are used to moves his arms up, down, backwards and forwards. It's interesting and worth pointing out that this isn't a broken control system - Young Horses, Inc.has purposefully done this to put the gamer in the shoes of an Octopus who struggles to do what most of us consider to be basic jobs. 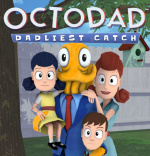 Yet somehow, behind the character's clumsy exterior and the developer's insistence on creating a traumatic experience for both Octodad and the player, Dadliest Catch is a charming title with a great cast of characters. Although it's not a huge game and will likely take around 3 hours to finish (including a couple of free DLC levels that come included), it doesn't take long to feel sympathetic towards Octodad's limitations and to build an emotional attachment to him. Empathy is the key component towards driving the player into wanting to help Octodad, so it was always going to be vital that he was a lovable and relatable character. On a technical level, Dadliest Catch suffers from slowdown throughout on Wii U and this is most noticeable during autosave sections. There is one section in particular when Octodad is attempting to reconnect some cables into their plug sockets, and the slowdown and framerate was so bad for us that it was almost unplayable. It's not enough to ruin the game, but it's a negative on what is otherwise a well presented title. 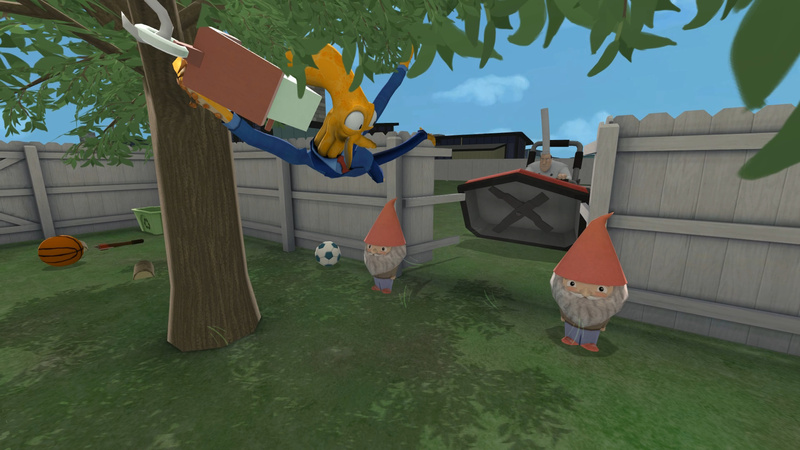 There's also the inclusion of a multiplayer mode, which allows up to 4 players to take ownership of one of Octodad's limbs, ensuring teamwork is king – imagine what it must be like to participate in a three-legged race and it will give an insight into the planning and constant communication needed to make it work. It's utter delirium and exists for no other reason other than the love of laughter. 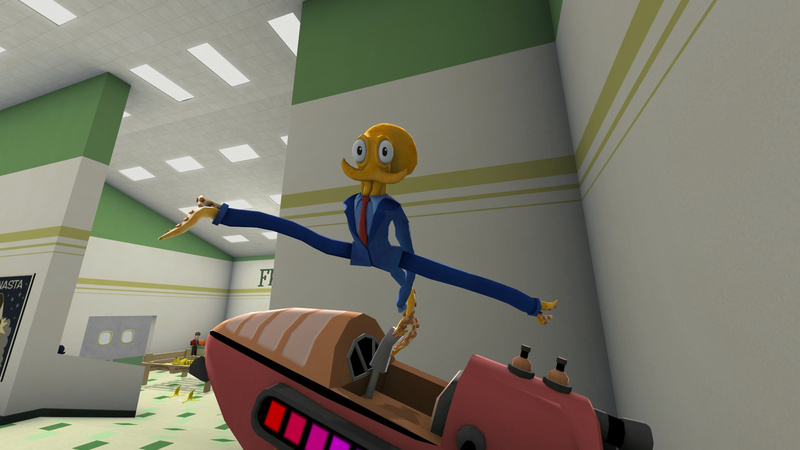 As a game, Octodad seems less interested in entertaining and is more intent on taking the player through a journey, and by its own design can be an incredibly stressful affair. Break it down and you'll see why: challenges involve shopping, chopping wood and pouring yourself a cup of coffee. Add this on top of a few technical hiccups, such as slowdown and some drops in framerates, and you have a middle of the road title. However, this game is all about portraying life's bigger picture and would appear to be one big analogy for some of life's biggest challenges and the problems some of us face, depending on how you interpret it. That in itself is good art and also where Octodad is a success. The real fun lies in seeking your own meaning behind this bizarre title and helping Octodad cross the metaphorical finish lines that seem to plague his every turn - no matter how mundane the challenges are or how taxing it may be to guide him through life, he's a character you'll want to see succeed. You should try the iOS controls, the ones on the Wii U sound perfectly normal by comparison! All that promotion... for this? The controls are maddening. But games like Octodad are what more indies should be making: totally original concepts with good art design and compelling gameplay. Instead, Octodad is a, well, octopus in an ocean full of 2D platformer fish. Also, based on this review I would have thought a 7 would be a more appropriate score. A couple instances of bad framerate are the only negative points made in the article. I played a demo on ps4 in a game store, I thought it was awful! I'm pretty sure you completely missed the point of this game. Is this not comedy? I agree... it seems like this review was written by someone who wasn't into the game's concept from the start. Good review, I definitely agree on the empathy argument, but I still haven't experienced any technical difficulties in my playthrough. I really like the setting and the characters, as well as the gameplay (I also think gameplay should allow for more creativity from the player, though), so my personal score is more like a 7.5/10. Just a quick note: "...depending on HOW you interpret it." Seems like a hardware problem to me. Wii U doesn't seem to hold it tight pretty well. PC version don't show such technical shortcomings as far as I remember. Too bad it's not a flawless port. I was really interested on this. For me this review misses the mark a bit. This game is all about physical humor and clever dialogue. If you ever have laughed at a game like QWOP, this is basically a 3D, fleshed out version of that. The goofy controls can be mastered, but the process of getting there is hilarious. The only flaw to this game is the slow down, which is rarely an issue. The short length is perfect for a game of this style. For those who want it, there's a load of replayability with achievements. Also the review is inaccurate about the controls. The triggers are only used for legs, not arms. Maybe the reviewer never came to grips with the controls? Yeah, I experienced a lot of slowdown. When trying to get all the ties, it just made it frustrating. @rushiosan Possibly. I've played the PS4 version and it was smooth as butter, so it probably is the hardware (or maybe just a bad port). "Less interested in entertaining"? I thought the bumbling controls were hilarious and a constant source of entertainment. I feel like it's more about humor than any sort of emotional connection. I've been thinking that the controls look incredible frustrating, even if I love the nonsensical humor. Sadly, that's probably a dealbreaker for me. Might get this when it's on sale. I don't think the technical issues are worth the $14.99 price tag right now. "There's also the slight problem of an over eccentric chef named Fujimoto, who for whatever reason has it in for the protagonist." ;Maybe cause he's an Octopus? I'm all about this game...at some point. But a 3 hr game for $14.99 (closer to $20 in Canada) is crazy. It's only Fun in multiplayer in my opinion. I managed to get it before anyone else a week before hand on Wii U. It's brilliant. It's one of my favourite Indie games that I've ever played. The guys at Young Horses are pretty sound too. It just came out today for Android and iOS. Plays beautifully on my Xperia Z3! Guess I'll play my "free" psn copy I got a while ago instead of this port. I just beat this game (on Wii U). It's very fun and innovative, but only 5 hours. Fortunately many hidden collectibles and unlockable achievements, time trials, bonus chapters, and co-op control bring lots of replay value. The developers could do an update to fix the area with the framerate drop and the muted voices on tv though - but it's still a great game. 8/10. This game looks awful and boring. Should cost a dollar. I'm really not a fan of the gameplay, since it retains the punchline of the game at the cost of playability, but the story and characters are incredibly charming. I always felt like this and the first game should've been animated movies, instead. @Minotaurgamer Don't judge a book by its cover. @Inkling haha seriously guys the hardware? What are you guys 5! Of course is a bad port! The Wii u can do smash 1080p 60 frames or bayonetta 2 oh no but Octodad really maxed the wiiu. Must be weak hardware. Lol. My review of this was pretty similar. Great comedy concept that eventually goes in the wrong direction. Technically, it runs awful on the Wii U. In the third paragraph, I don't think you meant Octodad tries to "prolong" the visit to the aquarium. "Postpone", maybe? "Prolong" would imply he wants to stay there, not that he wants to get out of visiting entirely. I was on the fence with this one but I don't think I'll buy it now. Sounds like a fantastic concept. But sadly it doesn't seem to be such a great game, and expensive!